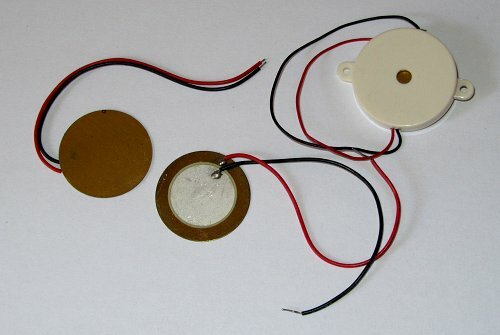 A piezo disk can be used to sense vibration or used as a buzzer to produce an audible sound. The photo below shows what physical piezo disks look like. They may come packaged in a plastic case. If you buy a piezo sensor that is package in a plastic case, make sure that it is not a buzzer that has built in electronics to make it produce a sound. If this is the case, you will not be able to use it as a sensor.